Japanese sword blades were often forged with different profiles, different blade thicknesses, and varying amounts of grind. Wakizashi and tantō were not simply scaled-down katana; they were often forged without ridge (hira-zukuri) or other such forms which were very rare on katana. The steel used in sword production is known as tamahagane (玉鋼:たまはがね), or "jewel steel" (tama - ball or jewel, hagane - steel). Tamahagane is produced from iron sand, a source of iron ore, and mainly used to make Samurai swords, such as the katana, and some tools. The smelting process used is different from the modern mass production of steel. A clay vessel about 1.1 m (3 ft 7 in) tall, 3 m (10 ft) long, and 1.1 m (3 ft 7 in) wide is constructed. This is known as a tatara. After the clay tub has set, it is fired until dry. A charcoal fire is started from soft pine charcoal. Then the smelter will wait for the fire to reach the correct temperature. At that point he will direct the addition of iron sand known as satetsu. This will be layered in with more charcoal and more iron sand over the next 72 hours. Four or five people need to constantly work on this process. It takes about a week to build the tatara and complete the iron conversion to steel. Because the charcoal cannot exceed the melting point of iron, the steel is not able to become fully molten, and this allows both high and low carbon material to be created and separated once cooled. When complete, the Tatara is broken to remove the steel bloom, known as a kera. At the end of the process the tatara will have consumed about 10 short tons (9.1 t) of satetsu and 12 short tons (11 t) of charcoal leaving about 2.5 short tons (2.3 t) of kera, from which less than a ton of tamahagane can be produced. A single kera can typically be worth hundreds of thousands of dollars, making it many times more expensive than modern steels. The swordsmiths will carefully break the kera apart, and separate the various carbon steels. The lowest carbon steel is called hocho-tetsu (soft iron), which is used for the shingane (translated as "core-steel") of the blade. The high carbon steel (tamahagane) and higher carbon pig iron, called nabe-gane, will then be forged in alternating layers, using very intricate methods to form the very hard steel for the edge, called hagane (edge steel), and the springy metal jacket, called kawagane (skin steel). The most useful process is the folding, where the metals are forge welded, folded, and welded again, as many as 16 times. The folding removes impurities and helps even out the carbon content, while the alternating layers combine hardness with ductility to greatly enhance the toughness. Currently, tamahagane is only made three or four times a year by Nittoho and Hitachi Metals during winter in a wood building and is only sold to the master swordsmiths to use once it is made. The forging of a Japanese blade typically took many days or weeks, and was considered a sacred art, traditionally accompanied by a large panoply of Shinto religious rituals. As with many complex endeavors, rather than a single craftsman, several artists were involved. There was a smith to forge the rough shape, often a second smith (apprentice) to fold the metal, a specialist polisher, and even a specialist for the edge itself. Often, there were sheath, hilt, and handguard specialists as well. The steel bloom, or kera, that is produced in the tatara contains steel that varies greatly in carbon content, ranging from wrought iron to pig iron. Three types of steel are chosen for the blade; a very low carbon steel called hocho-tetsu is used for the core of the blade (shingane). The high carbon steel (tamahagane), and the remelted pig iron (cast iron or nabe-gane), are combined to form the outer skin of the blade (kawagane). Only about 1/3 of the kera produces steel that is suitable for sword production. The best known part of the manufacturing process is the folding of the steel, where the swords are made by repeatedly heating, hammering and folding the metal. The process of folding metal to improve strength and remove impurities is frequently attributed to specific Japanese smiths in legends. In traditional Japanese sword making, the low-carbon iron is folded several times by itself, to purify it. This produces the soft metal to be used for the core of the blade. The high-carbon steel and the higher-carbon cast-iron are then forged in alternating layers. The cast-iron is heated, quenched in water, and then broken into small pieces to help free it from slag. The steel is then forged into a single plate, and the pieces of cast-iron are piled on top, and the whole thing is forge welded into a single billet, which is called the age-kitae process. The billet is then elongated, cut, folded, and forge welded again. The steel can be folded transversely, (from front to back), or longitudinally, (from side to side). Often both folding directions are used to produce the desired grain pattern. This process, called the shita-kitae, is repeated from 8 to as many as 16 times. After 20 foldings, (220, or 1,048,576 individual layers), there is too much diffusion in the carbon content. The steel becomes almost homogeneous in this respect, and the act of folding no longer gives any benefit to the steel. Depending on the amount of carbon introduced, this process forms either the very hard steel for the edge (hagane), or the slightly less hardenable spring steel (kawagane) which is often used for the sides and the back. It homogenized the metal within the layers, spreading the elements (such as carbon) evenly throughout the individual layers, increasing the effective strength by decreasing the number of potential weak points. Generally, swords were created with the grain of the blade (hada) running down the blade like the grain on a plank of wood. Straight grains were called masame-hada, wood-like grain itame, wood-burl grain mokume, and concentric wavy grain (an uncommon feature seen almost exclusively in the Gassan school) ayasugi-hada. The difference between the first three grains is that of cutting a tree along the grain, at an angle, and perpendicular to its direction of growth (mokume-gane) respectively, the angle causing the "stretched" pattern. In addition to folding the steel, high quality Japanese swords are also composed of various distinct sections of different types of steel. This manufacturing technique uses different types of steel in different parts of the sword to accentuate the desired characteristics in various parts of the sword beyond the level offered by differential heat treatment. The vast majority of modern katana and wakizashi are the maru type (sometimes also called muku) which is the most basic, with the entire sword being composed of a single steel. However, due to modern steels being used, this does not cause the sword to be fragile like it did throughout history. The kobuse type is made using two steels, which are called hagane (edge steel) and shingane (core steel). Honsanmai and shihozume types add the third steel, called kawagane (skin steel). There are almost an infinite number of ways the steel could be assembled, which often varied considerably from smith to smith. Sometimes the edge-steel is "drawn out" (hammered into a bar), bent into a 'U' shaped trough, and the very soft core steel is inserted into the harder piece. Then they are forge welded together and hammered into the basic shape of the sword. By the end of the process, the two pieces of steel are fused together, but retain their differences in hardenability. The more complex types of construction are typically only found in antique weapons, with the vast majority of modern weapons being composed of a single section, or at most two or three sections. Another way is to assemble the different pieces into a block, forge weld it together, and then draw out the steel into a sword so that the correct steel ends up in the desired place. This method is often used for the complex models, which allow for parrying without fear of damaging the side of the blade. To make honsanmai or shihozume types, pieces of hard steel are added to the outside of the blade in a similar fashion. The shihozume and soshu types are quite rare, but added a rear support. During the Bronze Age, the swords found in Japan were very similar in shape to those found in continental Asia, i.e., China or Korea, and the Japanese adopted the Chinese convention for sword terminology along with metallurgy and swordmaking technology, classifying swords into the (either straight or curved) single-edged variety called tō 刀 and the (straight) double-edged variety called ken 剣. There is some small overlap in that there were some double-edged curved swords such as Tulwars or Scimitars which were called Tō, because the curvature meant that the "front" edge was used in the overwhelming majority of instances. Over time, however, the curved single-edged sword became so dominant a style in Japan that tou and ken came to be used interchangeably to refer to swords in Japan and by others to refer to Japanese swords. For example, the Japanese typically refer to Japanese swords as 日本刀 nihontō ("Japanese tou" i.e. "Japanese (single-edged) blade"), while the character ken 剣 is used in such terms as kendo and kenjutsu. Modern formal usage often uses both characters in referring to a collection of swords, for example, in naming the Japanese Sword Museum 日本美術刀剣博物館[clarification needed]. The prototype of the Japanese sword was the chokutō 直刀, or "straight (single-edged) sword", a design that can be fairly described as a Japanese sword without any curvature, with a handle that is usually only a few inches long and therefore suitable for single-handed use only, with a sword guard that is prominent only on the front (where the edge is pointed) and back sides and sometimes only on the front side of the sword blade, and with a ring pommel. This design was moderately common in China and Korea during the Warring States and Han Dynasties, fading from popularity and disappearing during the Tang Dynasty. A number of such swords have been excavated in Japan from graves dating back to the kofun period. As the chokutō evolved into the Japanese sword as it is known today, it acquired its characteristic curvature and Japanese style fittings, including the long handle making it suitable for either one-handed or two-handed use, the non-protruding pommel, and a handguard that protruded from the sword in all directions, i.e., that is not a cross piece or a guard for the edge or edge and back sides of the blade only but a guard intended to protect the hand on all sides of the blade. The shape of the Japanese tsuba evolved in parallel with Japanese swordsmithing and Japanese swordsmanship. As Japanese swordsmiths acquired the ability to achieve an extremely hard edge, Japanese swordsmanship evolved to protect the edge against chipping, notching, and breakage by parrying with the sides or backs of swords, avoiding edge-to-edge contact. This in turn resulted in the need to protect the sword hand from a sliding blade in parries on the sides and backs, i.e., parts of the blade other than the edge side, forming the rationale behind the Japanese styled tsuba, which protrudes from the blade in every direction. This style of parrying in Japanese swordsmanship has also resulted in some antique swords that have been used in battle exhibiting notches on the sides or backs of blades. A katana, shown at a long angle to reveal the nioi, which is the bright, wavy line following the hamon. The inset shows a close-up of the nioi, appearing as the speckled area beside the bright hardened-edge. The nioi is made up of niye, which are single martensite crystals surrounded by darker pearlite. Having a single edge provides certain advantages; one being that the rest of the sword can be used to reinforce and support the edge. The Japanese style of sword-making takes full advantage of this. When forging is complete, the steel is not quenched in the conventional European fashion (i.e. : uniformly throughout the blade). Steel’s exact flex and strength vary dramatically with heat treating. If steel cools quickly it becomes martensite, which is very hard but brittle. Slower and it becomes pearlite, which bends easily and does not hold an edge. To maximize both the cutting edge and the resilience of the sword spine, a technique of differential heat-treatment is used. In this specific process, referred to as differential hardening or differential quenching, the sword is painted with layers of clay before heating, providing a thin layer or none at all on the edge of the sword, ensuring quick cooling to maximize the hardening for the edge. A thicker layer of clay is applied to the rest of the blade, causing slower cooling. This creates softer, more resilient steel, allowing the blade to absorb shock without breaking. This process is sometimes erroneously called differential tempering but this is actually an entirely different form of heat treatment. To produce a difference in hardness, the steel is cooled at different rates by controlling the thickness of the insulating layer. By carefully controlling the heating and cooling speeds of different parts of the blade, Japanese swordsmiths were able to produce a blade that had a softer body and a hard edge. This process also has two side effects that have come to characterize Japanese swords: 1.) It causes the blade to curve and 2.) It produces a visible boundary between the hard and soft steel. When quenched, the uninsulated edge contracts, causing the sword to first bend towards the edge. However, the edge cannot contract fully before the martensite forms, because the rest of the sword remains hot and in a thermally expanded state. Because of the insulation, the sword spine remains hot and pliable for several seconds, but then contracts much more than the edge, causing the sword to bend away from the edge, which aids the smith in establishing the curvature of the blade. Also, the differentiated hardness and the methods of polishing the steel can result in the hamon 刃紋 (frequently translated as "tempering line" but better translated as "hardening pattern"). 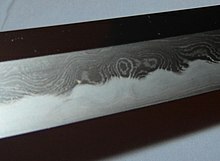 The hamon is the visible outline of the yakiba (hardened portion) and is used as a factor to judge both the quality and beauty of the finished blade. The various hamon patterns result from the manner in which the clay is applied. They can also act as an indicator of the style of sword-making, and sometimes as a signature for the individual smith. The differences in the hardenability of steels may be enhanced near the hamon, revealing layers or even different parts of the blade, such as the intersection between an edge made from edge-steel and sides made from skin-steel. If the thickness of the coating on the edge is balanced just right with the temperature of the water, the proper hardness can be produced without the need for tempering. However, in most cases, the edge will end up being too hard, so tempering the entire blade evenly for a short time is usually required to bring the hardness down to a more suitable point. The ideal hardness is usually between HRc58–60 on the Rockwell hardness scale. Tempering is performed by heating the entire blade evenly to around 400 °F (204 °C), reducing the hardness in the martensite and turning it into a form of tempered martensite. The pearlite, on the other hand, does not respond to tempering, and does not change in hardness. 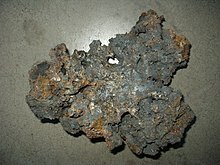 Tamahagane, as a raw material, is a highly impure metal. Formed in a bloomery process, the bloom of sponge iron begins as an inhomogeneous mixture of wrought iron, steels, and pig iron. The pig iron contains more than 2% carbon. The high-carbon steel has about 1 to 1.5% carbon while the low-carbon iron contains about 0.2%. Steel that has a carbon content between the high and low carbon steel is called bu-kera, which is often resmelted with the pig iron to make saga-hagane, containing roughly 0.7% carbon. Most of the intermediate-carbon steel, wrought iron and resmelted steel will be sold for making other items, like tools and knives, and only the best pieces of high-carbon steel, low-carbon iron, and pig iron are used for swordsmithing. The various metals are also filled with slag, phosphorus and other impurities. Separation of the various metals from the bloom was traditionally performed by breaking it apart with small hammers dropped from a certain height, and then examining the fractures, in a process similar to the modern Charpy impact test. The nature of the fractures are different for different types of steel. The high-carbon steel, in particular, contains pearlite, which produces a characteristic pearlescent-sheen on the crystals. In 1993, Jerzy Piaskowski performed an analysis of a katana of the kobuse type by cutting the sword in half and taking a cross section. The analysis revealed a carbon content ranging from 0.6 to 0.8% carbon at the surface, but only 0.2% at the core. The steel in even the ancient swords may have sometimes come from whatever steel was available at the time. Due to its rarity in the ancient world, steel was usually recycled, so broken tools, nails and cookware often provided a ready supply of steel. Even steel looted from enemies in combat was often valued for its use in swordsmithing. The different layers in this blade are evident due to the difference in their carbon content, which is exaggerated at the hamon giving it a wispy appearance. According to Smith, the different layers of steel are made visible during the polishing due to one or both of two reasons: 1.) Either the layers have a variation in carbon content, or 2.) they have variation in the content of slag inclusions. When the variation is due to slag inclusions by themselves, there will not be a noticeable effect near the hamon, where the yakiba meets the hira. Likewise, there will be no appreciable difference in the local hardness of the individual layers. A difference in slag inclusions generally appear as layers that are somewhat pitted while the adjacent layers are not. In one of the first metallurgical studies, Professor Kuni-ichi Tawara suggests that layers of high slag may have been added for practical as well as decorative reasons. Although slag has a weakening effect on the metal, layers of high slag may have been added to diffuse vibration and dampen recoil, allowing easier use without a significant loss in toughness. However, when the patterns occur from a difference in carbon content, there will be distinct indications of this near the hamon, because the steel with higher hardenability will become martensite beyond the hamon while the adjacent layers will turn into pearlite. This leaves a distinct pattern of bright nioi, which appear as bright streaks or lines that follow the layers a short distance away from the hamon and into the hira, giving the hamon a wispy or misty appearance. The patterns were most likely revealed during the polishing operation by using a method similar to lapping, without bringing the steel to a full polish, although sometimes chemical reactions with the polishing compounds may have also been used to provide a level of etching. The differences in hardness primarily appear as a difference in the microscopic scratches left on the surface. The harder metal produces shallower scratches, so it diffuses the reflected light, while the softer metal has deeper, longer scratches, appearing either shiny or dark depending on the viewing angle. Layered steel forms a wood-grain pattern when the blade is filed and polished. Blue mokumegane steel, showing knot-like patterns in the metal. Metallurgy did not arise as a science until the early 20th century. Before this, metallography was the primary method used for studying metals. Metallography is the study of the patterns in metals, the nature of fractures, and the microscopic crystal-formations. However, neither metallography as a science nor the crystal theory of metals emerged until nearly a century after the invention of the microscope. The ancient swordsmiths had no knowledge of metallurgy, nor did they understand the relationship between carbon and iron. Everything was typically learned by a process of trial-and-error, apprenticeship, and, as sword-making technology was often a closely guarded secret, some espionage. Prior to the 14th century, very little attention was paid to the patterns in the blade as an aesthetic quality. However, the Japanese smiths often prided themselves on their understanding of the internal macro-structure of metals. In Japan, steel-making technology was imported from China, most likely through Korea. The steel used in the Chinese swords, called chi-kang (combined steel), was similar to pattern welding, and edges of it were often forge welded to a back of soft iron, or jou thieh. In trying to copy the Chinese method, the ancient smiths paid much attention to the various properties of steel, and worked to combine them to produce an internal macro-structure that would provide a similar combination of hardness and toughness. Like all trial-and-error, each swordsmith often attempted to produce an internal structure that was superior to swords of their predecessors, or even ones that were better than their own previous designs. The harder metals provided strength, like "bones" within the steel, whereas the softer metal provided ductility, allowing the swords to bend before breaking. In ancient times, the Japanese smiths would often display these inhomogeneities in the steel, especially on fittings like the guard or pommel, creating rough, natural surfaces by letting the steel rust or by pickling it in acid, making the internal structure part of the entire aesthetic of the weapon. In later times, this effect was often imitated by partially mixing various metals like copper together with the steel, forming mokume (wood-eye) patterns, although this was unsuitable for the blade itself. After the 14th century, more attention began to be paid to the patterns in the blade as an aesthetic quality. Intentionally decorative forging-techniques were often employed, such as hammering dents in certain locations, which served only to create a wood-eye pattern when the sword was filed and polished into shape, or by intentionally forging-in layers of high slag content. 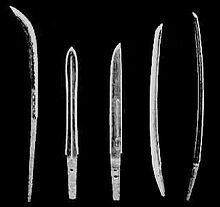 By the 17th century, decorative hardening methods were often being used to increase the beauty of the blade, by shaping the clay. Hamons with trees, flowers, pill boxes, or other shapes became common during this era. By the 19th century, the decorative hamons were often being combined with decorative folding-techniques to create entire landscape-portraits, often portraying specific islands or scenery, crashing waves in the ocean, and misty mountain-peaks. Antique Japanese wakizashi sword blade showing the horimono of a chrysanthemum. Almost all blades are decorated, although not all blades are decorated on the visible part of the blade. Once the blade is cool, and the mud is scraped off, the blade has designs and grooves cut into it. One of the most important markings on the sword is performed here: the file markings. These are cut into the tang (nakago), or the hilt-section of the blade, during shaping, where they will be covered by a tsuka or hilt later. The tang is never supposed to be cleaned: doing this can cut the value of the sword in half or more. The purpose is to show how well the blade steel ages. A number of different types of file markings are used, including horizontal, slanted, and checked, known as ichi-monji, ko-sujikai, sujikai, ō-sujikai, katte-agari, shinogi-kiri-sujikai, taka-no-ha, and gyaku-taka-no-ha. A grid of marks, from raking the file diagonally both ways across the tang, is called higaki, whereas specialized "full dress" file marks are called kesho-yasuri. Lastly, if the blade is very old, it may have been shaved instead of filed. This is called sensuki. While ornamental, these file marks also serve the purpose of providing an uneven surface which bites well into the hilt which fits over it, and is made from wood. It is this pressure fit for the most part that holds the hilt in place, while the mekugi pin serves as a secondary method and a safety. Some other marks on the blade are aesthetic: signatures and dedications written in kanji and engravings depicting gods, dragons, or other acceptable beings, called horimono. Some are more practical. The so-called "blood groove" or fuller does not in actuality allow blood to flow more freely from cuts made with the sword, but is simply to reduce the weight of the sword while keeping structural integrity and strength. Grooves come in wide (bo-hi), twin narrow (futasuji-hi), twin wide and narrow (bo-hi ni tsure-hi), short (koshi-hi), twin short (gomabushi), twin long with joined tips (shobu-hi), twin long with irregular breaks (kuichigai-hi), and halberd-style (naginata-hi). Japanese sword blade, sharpening stone, and water bucket at the 2008 Cherry Blossom Festival, Seattle Center, Seattle, Washington. When the rough blade is completed, the swordsmith turns the blade over to a polisher called a togishi, whose job it is to refine the shape of a blade and improve its aesthetic value. The entire process takes considerable time, in some cases easily up to several weeks. Early polishers used three types of stone, whereas a modern polisher generally uses seven. The modern high level of polish was not normally done before around 1600, since greater emphasis was placed on function over form. The polishing process almost always takes longer than even crafting, and a good polish can greatly improve the beauty of a blade, while a bad one can ruin the best of blades. More importantly, inexperienced polishers can permanently ruin a blade by badly disrupting its geometry or wearing down too much steel, both of which effectively destroy the sword's monetary, historic, artistic, and functional value. In Japanese, the scabbard for a katana is referred to as a saya, and the handguard piece, often intricately designed as an individual work of art—especially in later years of the Edo period—was called the tsuba. Other aspects of the mountings (koshirae), such as the menuki (decorative grip swells), habaki (blade collar and scabbard wedge), fuchi and kashira (handle collar and cap), kozuka (small utility knife handle), kogai (decorative skewer-like implement), saya lacquer, and tsuka-ito (professional handle wrap, also named emaki), received similar levels of artistry. There is a pommel at the base known as a kashira, and there is often a decoration under the braided wrappings called a menuki. A bamboo peg called a mekugi is slipped through the tsuka and through the tang of the blade, using the hole called a mekugi-ana ("peg hole") drilled in it. This anchors the blade securely into the hilt. To anchor the blade securely into the sheath it will soon have, the blade acquires a collar, or habaki, which extends an inch or so past the hand guard and keeps the blade from rattling. The sheaths themselves are not an easy task. There are two types of sheaths, both of which require exacting work to create. One is the shirasaya, which is generally made of wood and considered the "resting" sheath, used as a storage sheath. The other sheath is the more decorative or battle-worthy sheath which is usually called either a jindachi-zukuri, if suspended from the obi (belt) by straps (tachi-style), or a buke-zukuri sheath if thrust through the obi (katana-style). Other types of mounting include the kyū-guntō, shin-guntō, and kai-guntō types for the twentieth-century military. Traditional swords are still made in Japan and occasionally elsewhere; they are termed "shinsakuto" or "shinken" (true sword), and can be very expensive. These are not considered reproductions as they are made by traditional techniques and from traditional materials. Swordsmiths in Japan are licensed; acquiring this license requires a long apprenticeship. Outside Japan there are a couple of smiths working by traditional or mostly traditional techniques, and occasional short courses taught in Japanese swordsmithing. The only Japanese-licensed swordsmith outside Japan was Keith Austin (art-name Nobuhira or Nobuyoshi), who died in 1997. A very large number of low-quality reproduction katana and wakizashi are available; their prices usually range between $10 to about $200. These cheap blades are Japanese in shape only—they are usually machine made and machine sharpened, and minimally hardened or heat-treated. The hamon pattern (if any) on the blade is applied by scuffing, etching, or otherwise marking the surface, without any difference in hardness or temper of the edge. The metal used to make low-quality blades is mostly cheap stainless steel, and typically is much harder and more brittle than true katana. Finally, cheap reproduction Japanese swords usually have fancy designs on them since they are just for show. Better-quality reproduction katana typically range from $200 to about $1000 (though some can go easily above two thousand for quality production blades, folded and often traditionally constructed and with a proper polish ), and high-quality or custom-made reproductions can go up to $15,000–$50,000. These blades are made to be used for cutting, and are usually heat-treated. High-quality reproductions made from carbon steel will often have a differential hardness or temper similar to traditionally made swords, and will show a hamon; they won't show a hada (grain), since they're not often made from folded steel. A wide range of steels are used in reproductions, ranging from carbon steels such as 1020, 1040, 1060, 1070, 1095, and 5160, stainless steels such as 400, 420, 440, to high-end specialty steels such as L6 and D2. Most cheap reproductions are made from inexpensive stainless steels such as 440A (often just termed "440"). With a normal Rockwell hardness of 56 and up to 60, stainless steel is much harder than the back of a differentially hardened katana (HR50), and is therefore much more prone to breaking, especially when used to make long blades. Stainless steel is also much softer at the edge (a traditional katana is usually more than HR60 at the edge). Furthermore, cheap swords designed as wall-hanging or sword rack decorations often also have a "rat-tail" tang, which is a thin, usually threaded bolt of metal welded onto the blade at the hilt area. These are a major weak point and often break at the weld, resulting in an extremely dangerous and unreliable sword. Some modern swordsmiths have made high quality reproduction swords using the traditional method, including one Japanese swordsmith who began manufacturing swords in Thailand using traditional methods, and various American and Chinese manufacturers. These however will always be different from Japanese swords made in Japan, as it is illegal to export the tamahagane jewel steel as such without it having been made into value-added products first. Nevertheless, some manufacturers have made differentially tempered swords folded in the traditional method available for relatively little money (often one to three thousand dollars), and differentially tempered, non-folded steel swords for several hundred. Some practicing martial artists prefer modern swords, whether of this type or made in Japan by Japanese craftsmen, because many of them cater to martial arts demonstrations by designing "extra light" swords which can be maneuvered relatively faster for longer periods of time, or swords specifically designed to perform well at cutting practice targets, with thinner blades and either razor-like flat-ground edges or even hollow ground edges. ^ a b "International Conference". jsme.or.jp. Retrieved 2014-05-27. ^ a b c "NOVA | Secrets of the Samurai Sword". pbs.org. Retrieved 2014-05-27. ^ a b c d e f "Japanse Swordmaking Process ~ www.samuraisword.com". samuraisword.com. Retrieved 2014-05-27. ^ Irvine, Gregory. The Japanese Sword: The Soul of the Samurai. London: V&A Publications, 2000. ^ "Japanese Sword Terminology & Related Glossary ~ www.samuraisword.com". samuraisword.com. Retrieved 2014-05-27. ^ a b "Hitachi Metals>Tale of tatara>Japanese Swords". hitachi-metals.co.jp. Retrieved 2014-05-27. ^ a b "Hitachi Metals>Tale of tatara>About Tatara". hitachi-metals.co.jp. Retrieved 2014-05-27. ^ "NOVA | Secrets of the Samurai Sword". pbs.org. Retrieved 2014-05-27. ^ "Hitachi Metals>Tale of tatara>Tama-hagone and the Japanese sword". hitachi-metals.co.jp. Retrieved 2014-05-27. ^ "Seminar on Japanese swords". docstoc.com. Archived from the original on 2014-01-10. Retrieved 2014-05-27. ^ a b "Chapter 11 Kinetics – Heat Treatment Lecture #14" (PDF). 28 February 2013. Retrieved 2014-07-05. ^ "BCIN DOCUMENT DISPLAY". bcin.ca. Retrieved 2014-05-27. ^ a b "A. G. Russell: Your Source for Knives and Knife Accessories". agrussell.com. Retrieved 2014-05-27. ^ "Sword for Sale! From Dragon Swords to Wood Swords, Asian Fans, Throwing Knives & Much More!". twiggyssamuraitreasures.com. Retrieved 2014-07-05. ^ "A Beginners Guide to Authentic Japanese Swords". sword-buyers-guide.com. Retrieved 2014-05-27. ^ "School of Swords | Learn about real swords | Real Japanese Swords | Real European Swords". schoolofswords.com. Archived from the original on 2012-12-11. Retrieved 2014-05-27. This page was last edited on 2 February 2019, at 18:35 (UTC).